Pioneer XW-SMA3-K review | What Hi-Fi? For most companies, hi-fi tech and the outdoors rarely make good bedfellows. 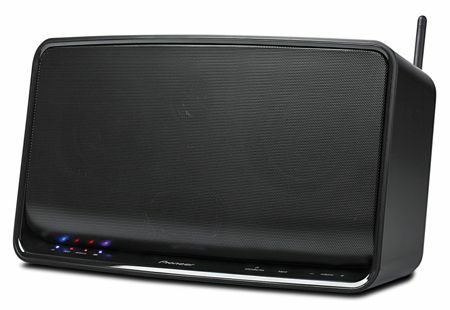 Pioneer, though, is seeking to challenge that notion with its portable, rechargeable – and splash-proof – XW-SMA3 20W wireless speaker. The SMA3 can connect to your home network via ethernet if you wish, but its real appeal lies in its wi-fi compatibility. There’s AirPlay on board for Apple fans, the HTC Connect equivalent if you own an HTC One smartphone, and also Pioneer’s own Wireless Direct feature. This last feature lets you connect to the speaker without the need for an existing network – which means that, if you like, you can take the dock to the park and carry on streaming. It’s also compatible with the DLNA standard – so you can access files stored on networked hard drives, too. Getting the unit hooked up to your network for AirPlay streaming is simple enough – simply plug your Apple device into the SMA3’s USB port, hold down a couple of buttons and the speaker does the rest. It’s a far cry from the AirPlay docks of old, which required set-up pages and passwords. Using Wireless Direct, likewise, is a simple case of holding down the network button and then tapping the SMA3 in your device’s settings. In use it’s a bit of a mixed bag. For a unit of this size (it’s about the size of a shoe-box) you might be expecting reasonably hefty low frequencies – but that isn’t on the table. We like the fact that Pioneer hasn’t gone down the gratuitously bassy route, but we can’t help feeling it’s missed a trick here. What bass you do get is a little imprecise, to boot. It’s a tad restrained elsewhere, too, with leading edges of notes sounding a bit soft and the midrange sounding rather closed-in, especially during more complex parts. But even though it’s not the punchiest sound, it’s never harsh and vocals are clear – which we applaud. We can’t totally recommend the SMA3. We love its ease of use – and its portability – but it needs more excitement and punch to really seal the deal.